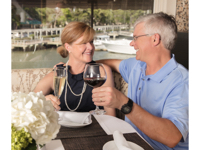 Sitting at the entrance to Shelter Cove Harbour on Hilton Head Island, ELA’S Blu Water Grille is like a warm, twinkly lighthouse, inviting guests to lower their sails and settle in for an exceptional dining experience. 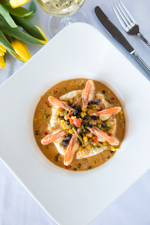 Serving lunch six days a week, Sunday brunch, dinner seven nights, and hosting custom-created special occasions, there are ample opportunities to set a course across menus designed with creativity, diversity, and quality in mind. Vernon joined ELA’S (the first of two, soon to be three Nightingale family-owned restaurants) in late 2016, and has done what he set out to do: elevate an already stellar menu to new heights. “We looked for great, locally sourced proteins and combined them with fresh, colorful sides that complemented the main component’s flavor, such as the Black Sea Bass and its sweet buttery flavor combined with blistered tomatoes and fresh fennel, to a create a flavorful and colorful dish that has the added benefit of being incredibly healthy,” Vernon said. Nestled as near to the sea as is architecturally possible, all manner of fish are the natural stars of the show. On a recent visit, the pan-seared diver scallops over crab risotto with truffle butter and crispy pancetta, placed a definitive check mark next to all things great about ELA’S carefully sourced seafood, and the considerate way in which Vernon brings together his proteins and their culinary accessories. Visiting the table that evening, with a twinkle in his eye, Vernon also talked about their new beef supplier, Brasstown Beef at Ridgefield Farm in Brasstown, North Carolina. The ranch’s Braunvieh and Angus cattle are carefully bred and pasture raised, with no antibiotics or hormones. He said the exceptional quality and taste of their beef is the result of their careful monitoring of each animal, and a commitment to the farm-to-table aspect of their business that aligns well with ELA’S “By Land” offerings. “From the addition of the tomahawk pork chop to the alteration of our classic New York strip to the reworking of the charcuterie, we wanted to create instant classics that have the added benefit of being beautifully plated to the point of turning heads when they make their way through the dining room,” Vernon said. Meghan and Thorsten Brockmann enjoy dinner with a view of Shelter Cove Harbour and Marina at ELA’S Blu Water Grille. With expansive water views, ELA’S is a popular place to watch fireworks on Tuesday nights in the summer. For the ELA’S team, in addition to making every visit exceptional and every meal delicious, holidays and special occasions are like stars by which they navigate through the year. Nightingale, and his children Erin Wasem, Lauren Mathis, and Alex Nightingale (the E-L-A of ELA’S), have created a relaxed, art-filled, and elegant space where guests are invited to reserve a table for an evening out or a waterside luncheon, or to schedule a celebration. 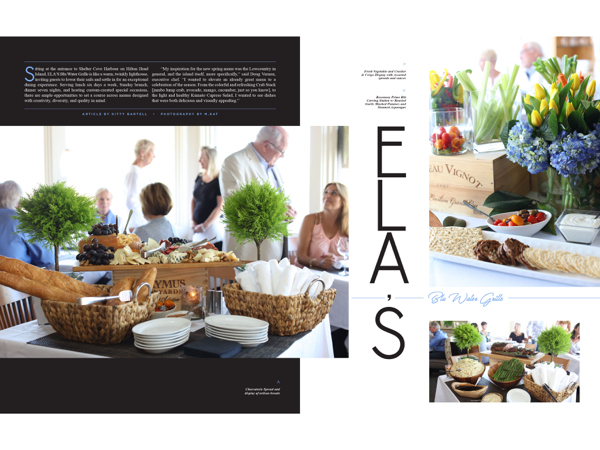 Skilled at hosting events up to 165 guests, ELA’S invites large corporate or private parties to reserve the entire restaurant, creating some deliciously memorable occasions. With their private rooms looking and feeling like the restaurant, whether it is a champagne reception, a post-wedding brunch, or cocktails and appetizers on their outdoor lawn, private events at ELA’S are about intimate, tailored experiences. “We have the flexibility to create special events with all different styles,” Nightingale said. 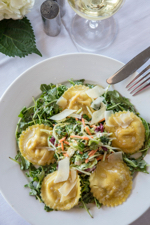 Thursdays through Sundays, ELA’S offers live entertainment, which provides a lovely backdrop not only for diners in the restaurant and on the patio, but a complimentary bonus for parties happening upstairs. Across the calendar, they are also known for their annual New Year’s Eve bash with a three-story balloon drop at midnight, along with exceptional Easter, Mother’s Day, and Father’s Day brunches. Applying their successful formula, the Nightingales imagined their second restaurant endeavor, and The Pearl Kitchen & Bar opened in Bluffton in April of 2016, with Alex Nightingale at the helm. They are now looking forward to their third collaboration when Roadhouse opens this summer in Port Royal. Think, barbecue with a twist. 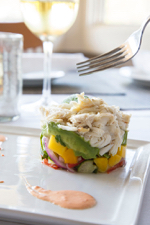 ELA’S Blu Water Grille is located at One Shelter Cove Lane, Hilton Head Island. Reservations are recommended, and because parking is limited, the ELA’S team recommends arriving by Uber or taxi on the Fourth of July and on Tuesday evenings (Shelter Cove’s weekly party and fireworks) throughout the summer season. For more information or to make reservations, please call (843) 785-3030, or visit elasgrille.com.